The Pulitzer Prize-winning creator of the hilarious "Bloom County" comic strip is back! 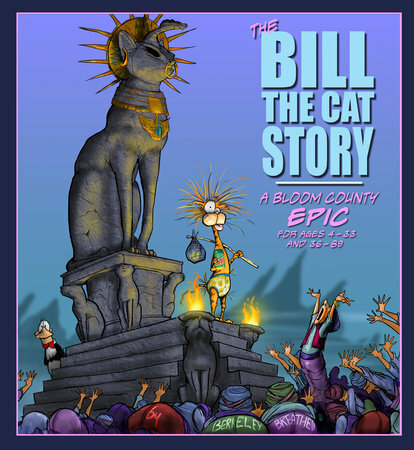 To help celebrate, here is the first ever Bloom County picture book, featuring fan-favorite Bill the Cat in an origin story. (Ack ack!) The perfect gift for Bloomers old and new. An Amazon Best Book of the Year and NY Times bestseller! Almost thirty-five years ago Berkeley Breathed launched a little-known yet laugh-inducing comic strip called "Bloom County" that was full of characters who instantly entered the public consciousness--none more so than Opus (the penguin) and Bill the Cat. Bloom County's popularity soared, it was soon syndicated nationally, had millions of daily readers, and before long its creator was awarded a Pulitzer Prize. Then, nine years later, "Bloom County" sadly came to a close. It had simply ceased being fun for Berkeley Breathed. Now, more than twenty-five years after it ended, "Bloom County" has returned in full force and humor online, with an ever-growing fanbase every bit as zealous as it was in the strip's heyday. For the comic's youngest fans, and for those who never stopped wishing for its return, here is an all-new, kid-friendly story for anyone who ever wanted to know the origin story of Bill the Cat. "Bloom County" has never been more fun!